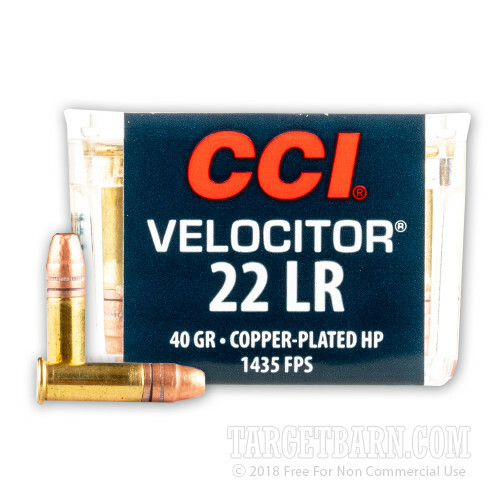 This 22 LR cartridge from CCI’s Velocitor line of ammunition sports a 40 grain projectile, the caliber’s original bullet weight and to this day its most common one as well. Despite the relative heft of its bullet, this round still delivers an exceedingly zippy 1,435 fps muzzle velocity. That means it’s able to deliver up to 22 percent more energy on impact at 100 yards than another comparable high-speed 22 LR hollow point round could muster. With such power and flat trajectory you’ll be armed with just what you need for satisfying plinking, target shooting, and varmint control. 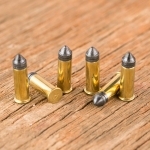 This round’s bullet is plated with copper to prevent bore fouling, and its hollow point cavity (based on the Speer Gold Dot design) provides expanding terminal performance that’ll drop small targets fast. Its propellant burns clean, so you won’t have to suffer an action that has become caked in corrosive residue, and its brass casing and non-corrosive rimfire primer mean it will sit happily on a shelf for years.